There's definitely much more Acura influence now. 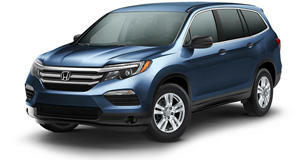 Although we’re still waiting for official details, the all-new 2016 Honda Pilot is about to have its live debut at this year’s Chicago Auto Show. What’s clearly obvious is that Honda went with a much more stylistic approach this time around. The new Pilot doesn’t look like its predecessor, which bore a strong resemblance to a bread box. Honestly, it looks like a larger CR-V. We particularly digthe LED taillights and the curved beltline. The interior is also a marked improvement and we can see some Acura styling influence. Full details to come.